We are here to provide you with cheap UK next day delivery services within the UK and EU. We currently have competitive uk next day delivery shipping rates with no hidden extras or charges. We have an automated UK next day delivery service booking system, which allows our system to automatically verify all PayPal payments corresponding to your order. We have three main cheap UK next day delivery services to offer. Using Parcel Delivery courier service, You can send off a package tomorrow from just £9.99, no other hidden charges. To use our parcel Delivery courier service All you would need to do, fill out the booking form, select the service you require and pay via PayPal! from this time, you can track all orders. You will be notified via email of all queries related to your shipment. We have over 5000 customers sending a huge amounts of UK next day delivery parcels every month. Our automated booking system automatically books or rebooks orders. With us, you can experience and send parcels next day via our UK next day delivery courier service as quickly as possible! Using our parcel delivery service has never been so easier, click 'Book now' , enter the parcel delivery address as well as parcel collections address and pay! We are the fastest, easiest cheap parcel delivery service online! Our new Europe shipping courier service has been added to our system. Our Parcel Delivery courier service, You can now ship to Europe from £19.99 . Our Europe shipping courier cheap parcel delivery rates are very competitive and includes the European charges at the delivery destinations. We cover 99% of Europe, France, Belgium, Turkey, Italy, Germany and many more. Click here to see our range of Europe shipping courier services. Proof of delivery signature captured. Parcel Delivery details can be tracked on-line...Signature image available the following day. 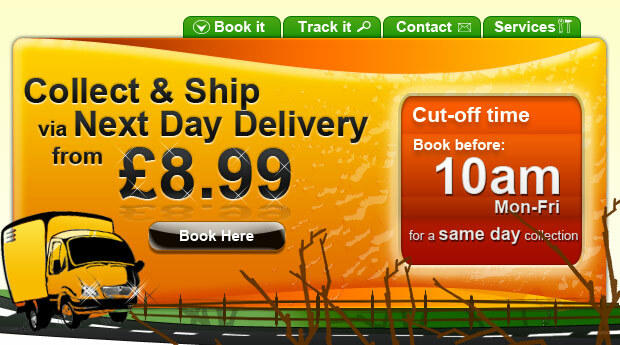 AND No.1 for delivering on time "
All of our next day delivery courier services are found in our 'Services' section. Click here for more info. If you have any questions related to your booking, use the contact form We have competitive prices, we are cheaper than most parcel delivery couriers out there in the UK, such as Fedex, DHl, citylink. Email us for more info and one of member of staff will get back to you within 24hrs.